No matter when the mood strikes, Red 8 is ready to tempt you with a delectable selection of Cantonese and Northern Chinese favorites. Prepared by our talented chefs in a theatrical open kitchen, the menu of traditional dishes available 24 hours daily will tantalize with its array of choices, including roasted Beijing Duck, fresh crab congee, shrimp wontons with noodles, chilled marinated chicken with Huadiao wine, and steamed Shanghainese dumplings with minced pork. Whether you're planning to order a bounty of dishes for a festive meal to be shared with family and friends, or you're craving a quick lunch or dinner of just your favorites, Red 8 is sure to satisfy in both taste and choice. Spring's changeable weather calls for delicious dishes that boost your appetite and tempt your taste buds. 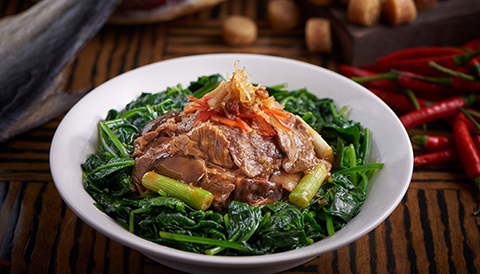 Enjoy the rich, enticing flavors of pigeon, beef and fresh baby spinach, prepared with authentic Chinese cooking methods.